Pull up a chair and sit down. I have something very important to say to you. People who tell you not to eat potatoes aren’t your real friends. I mean, okay, you shouldn’t eat potatoes like they’re the only vegetable in existence. French fries and fresh salads aren’t exactly interchangeable. But demonizing potatoes? Saying you should never eat them ever because OMG carbs? No. I won’t have that. Not in my house! My default method of potato preparation used to be roasting, but I’ve moved onto braising. And now I am all about braising. When you braise potatoes, you cook them on the stovetop first, add stock or broth, then finish them in the oven. The broth thickens to coat the potatoes and when they’re done, they’re tender, delicious, and they make you want to never eat un-braised potatoes again. Because I added smoked paprika to these braised potatoes, they’re tasty enough to eat on their own, but if you have a little time, whip up my Spicy Romesco Sauce to go with them. 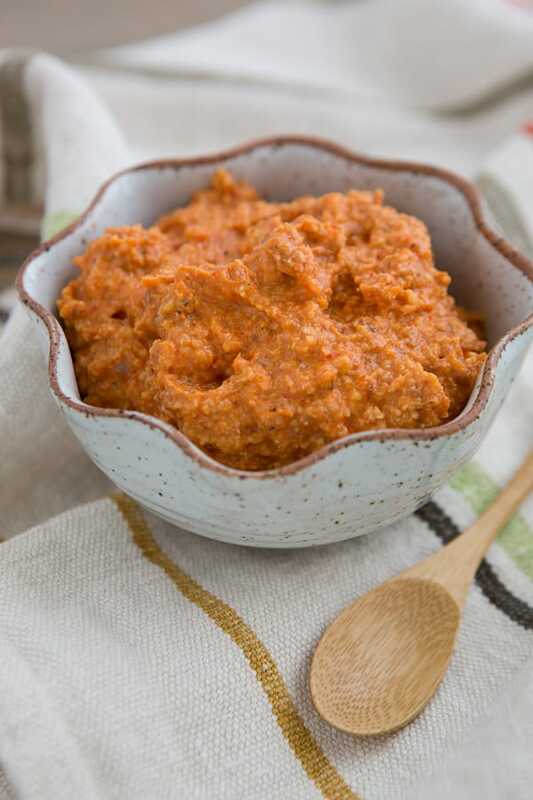 I make my romesco a little bit differently than most people—I use raw (not blanched!) almonds that get toasted in the oven, I never add bread, and I always add harissa for a spicy kick. We love it on baked potatoes, as a topping for burgers, and as a dipping sauce for steamed veggies. It freezes well so you can double the recipe and have some on hand for later. This post was originally published on April 14, 2014. 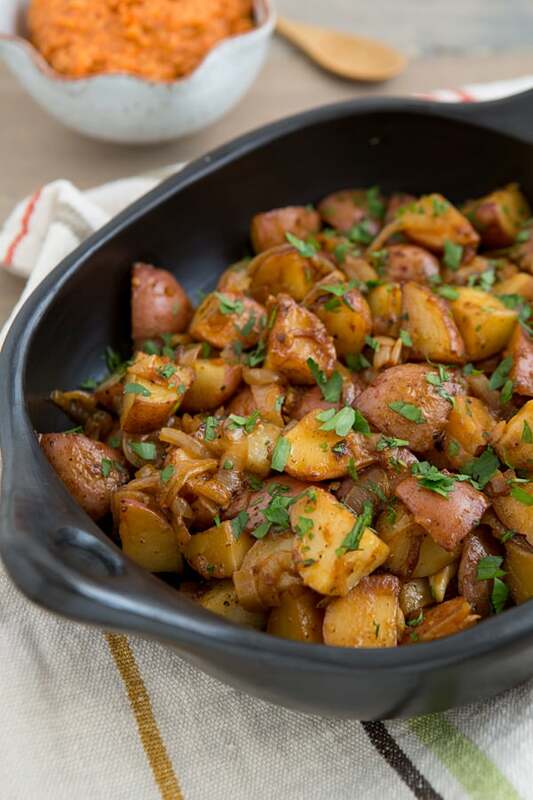 Smoked paprika makes these braised red potatoes extra delicious! Adapted from Martha Stewart Living’s Braised Potatoes. Heat the olive oil and butter in a large oven-safe skillet over medium-low heat. Add the onion and cook, stirring often, for about 15 minutes or until softened. Stir in the potatoes, garlic, and smoked paprika. Increase the heat to medium-high and continue to cook until the potatoes are just starting to brown, about 10 minutes. Remove from heat and pour in the broth. Cover the skillet and place it in the oven. Bake covered for about 10 minutes (or until the potatoes are tender), then remove the cover and cook until the liquid has reduced into a thick sauce that coats the potatoes, about 15-20 minutes more. Season with salt and pepper to taste and sprinkle with parsley, if using. Serve with Spicy Romesco Sauce. If you don’t have an oven-safe skillet, no worries! Simply transfer the potatoes to a roasting dish before putting them in the oven. Toss the tomato and pepper chunks with 1 tablespoon of olive oil on a large rimmed baking sheet. Roast for 25 minutes, stirring halfway through, then stir in the almonds and roast for 5 minutes more, until the almonds are toasted. (Be careful not to leave them in the oven for longer than this—they will burn!) Remove from the oven and allow to cool slightly. If you don’t have harissa, any hot sauce you have on hand will work in this. A few pinches of red pepper flakes can be substituted for the harissa too. Looks excellent and awesome.. great recipe!! You have made me want potatoes super bad now! Plus, I got a brand new oven safe pan and have been trying to figure out what to cook in it that doesn’t contain meat (most recipes are like stews and it’s spring now). Can’t wait to make this! Yes, why?! Unless you’re eating them for every meal, in which case yes, throw in some broccoli once in a while. this looks delicious! =) and the sauce is such a great addition!!! P.S. I loved your guest post on Pinch of Yum! It was so nice to see the meeting of two successful blogs!! I love potatoes in any form, but seriously, these are like the BEST potatoes. And I don’t throw around superlatives lightly. i hear you..potatoes and i go way back and i will eat them in any form. roasting it with olive oil, black pepper and garlic is my all time favorite. lately i have seen smashed potatoes which im dying to try. Amen to this sister! When people demonize potatoes I want to scream. If it comes from the dirt it’s not bad for you. That’s my motto! Lovely recipe. YUM! I want to say this is very Spanish! We had our share of patatas bravas in Spain a few months ago as well as romesco sauce! Spicy, flavorful and simple. I’ve made romesco but not the potatoes yet…so delish! Yes, it is! It’s totally perfect for a tapas party. I’m so in love with this…especially since I’m in love with potatoes…genius, kiersten!! You would totally love this recipe! I grew up on potatoes. Like we seriously had potato as part of our side dishes EVERY SINGLE NIGHT. It’s a tradition I’ve kept with my little family as well. Potatoes are the BEST! And I can’t wait to try these. I absolutely love potatoes! I usually bake or boil them until they are almost soft and then I chop them up and brown them in a pan. I’ve never braised them before, but it sounds so easy and looks really good, so I will definitely be giving it a try next time I get my potato craving! Love these potatoes, the romesco sauce sounds great! Well braised potatoes, I had no idea! I had planned to make some scalloped potatoes for an Easter dinner this weekend, but you’ve got me thinking braised now. And I’m with you on the demonization of potatoes – so unnecessary! Thanks for the recipe. Btw, loved your post on pinch of yum! Gave me lots to think about, as have all of your blogging on blogging posts so far. Thanks! Well, you can’t go wrong with scalloped potatoes either. 🙂 My family usually has hashbrown casserole for Easter and I’m totally going to miss it this year since we’re not going home for the holiday. Just found you from over at Pinch of Yum. Lovely to meet you! My husband and I are moving toward vegetarianism and I have a question about the potato recipe. What would you serve this with as a meal? Is it enough all by itself or would you add another dish? With the romesco sauce, it really is filling enough to make a meal. I’d serve it with a light salad on the side to round it out a little bit. If you skip the romesco sauce, the potatoes would be great with baked tofu or some other protein and maybe steamed broccoli or green beans on the side. Potatoes are awesome! They should NOT be skipped b/c they’re a carb. No way! They’re a healthy whole food, unprocessed, full of fiber and vitamins! Love them…and definitely wanna give this recipe a try! Yum! Exactly! I hate that so many people are abandoning the “everything in moderation” philosophy and jumping on the “eat potatoes and DIE, fatty” bandwagon. Boo to that. Kiersten I love the new look of your site. I only see it via RSS so I didn’t even realise. These potatoes sound so delicious and that sauce sounds and looks creamy and inviting! By the way I’m going to be buying your book 🙂 I love the idea of it! Thank you! We did the logo a few weeks ago and the rest of the redesign was finished last week. I am so excited about it! 🙂 I hope you enjoy the ebook! Oh I am SO with you – a life without potatoes just wouldn’t be worth living! Paprika spiced potatoes especially! This has just gone to the top of my Easter cooking list! Potatoes are some of life’s greatest pleasures, so I could never give them up! Though, I’ve actually NEVER BRAISED THEM BEFORE. Which seems truly unfortunate now. I can’t wait to try it AND your version of romesco! Go braise some potatoes. Immediately! What did the potato ever do to deserve so much hate? I love potatoes. Heck, I love just about everything. It’s called moderation. I really need to start braising my potatoes. YOU DO! Braised potatoes make regular potatoes taste like crap. Okay, not really. But they’re good. I’m going to make this for Easter! Do you know if the sauce would work with other nuts? I already have raw cashews on hand.. Thank you! I haven’t tried the sauce with other nuts, but I do know you can make really delicious sauces with cashews. 🙂 You could skip the step of roasting them in the oven and soak them in water for a few hours instead; the resulting sauce will be creamier than the romesco made with roasted almonds. You might have to tweak the proportions of the recipe a little bit, though. That is high praise! I’m glad you enjoyed the recipe! This is absolute goodness! Never would have thought of putting Romesco on roasted potatoes.